Water and Sanitation Support Organisation, (WSSO), PHED, Assam. Educational qualification: A Post-Graduate degree in Social Work /Social Science / Mass Communications with at least 3 years experience in Rural Water Supply & Sanitation sector or in Community Health or related field. Candidates with experience in Communication Strategy development, implementation and impact assessment of IEC interventions will be preferred. Candidate should be updated on development issues, social policies and have the ability to liaise with various departments, institutions, NGOs and experts. Educational qualification: A Post-Graduate Degree in Science / Environmental Science / Environmental Engineering / Social Science with at least 3 years’ experience in the field of Conducting Trainings / Human Resource Development related to Rural & Community Development or related field. 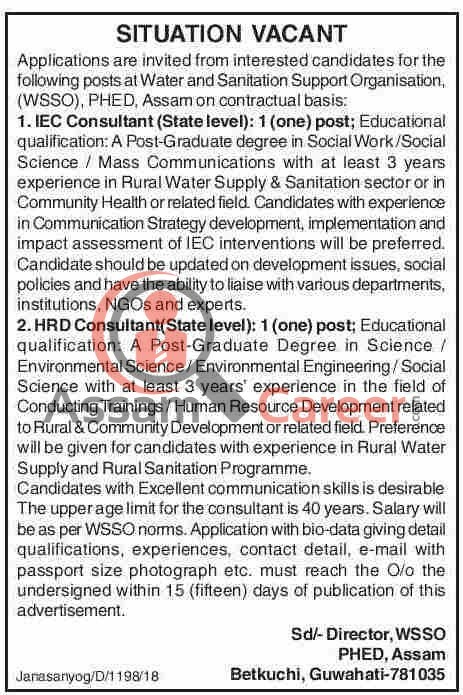 Preference will be given for candidates with experience in Rural Water Supply and Rural Sanitation Programme. Candidates with Excellent communication skills is desirable. Age : The upper age limit for the consultant is 40 years. Pay: Salary will be as per WSSO norms. How to Apply : Application with bio-data giving detail qualifications, experiences, contact detail, e-mail with passport size photograph etc. must reach the O/o the undersigned within 15 (fifteen) days of publication of this advertisement.